The Bureau of Land Management (BLM) is planning a roundup of wild horses living in the Cold Springs Herd Management Area (HMA) in remote eastern Oregon. 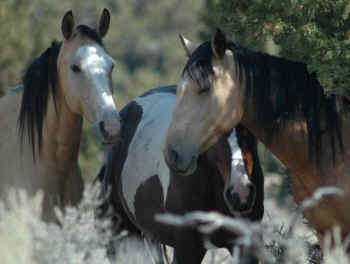 Although the agency plans to utilize the PZP birth control vaccine to humanely reduce population growth, it also intends to remove as many as 186 horses from their homes on the range, and to reduce the Cold Springs wild horse population to just 75 - a number that is much too small to maintain the genetic diversity and viability of this herd. The BLM needs to hear from YOU to demand equitable and humane alternatives to the large-scale removal of wild horses from their homes on the range. Just five years ago, 100 wild horses were cruelly rounded up and removed from this HMA. While the BLM's plan to manage this herd with fertility control should be supported, we must also demand that the BLM eliminate or minimize the numbers of horses removed from the range. The BLM can easily do this by reducing taxpayer-subsidized livestock grazing in this HMA. It is time for the BLM to keep the Cold Springs wild horses wild and break the unsustainable cycle of rounding them up, removing them from the range and stockpiling them in inadequate and cruel holding facilities.